Carpet is one of the most important and pleasant things which adds to the dazzling and organized ambiance of your place. But people often experience that a carpet can not only add to the charm of your room, but can also destroy it completely when it’s not properly cleaned and maintained. A stained and spotted carpet actually seems to be very eye-soring, whether it is light or dark in color. Here are a few techniques that will help you in cleaning your home carpet. When plain water doesn’t work out in cleaning your stains, you need to use some mild carpet cleaners like bleach, soda and many more. You need to dilute a small amount of mild bleach in water and then apply it on the carpet. But before applying, make sure you test it on a small portion of your carpet, as it shouldn’t harm or damage the color and texture of your carpet. First combine 1/4th c. of mild liquid dish detergent along with 1 gal. of warm water, after mixing properly apply it on the stains of your carpet. Once you spray it on the carpet, make sure you scrub it with a medium bristle brush if the stains are very hard. If all the stains are removed, clean the surface with clean water. The results say that dry cleaning technique used for cleaning your home carpet is one of the most efficient techniques. In this technique dry foam or powder is applied on the carpet fibers and then it is worked deeply upon the carpet with the help of a brush. When you wipe it out, along with the powder, all the dirt stains and spots are wiped out. Another carpet cleaning technique that is widely used is steam cleaning. For this technique, you need hot water as well as a cleaning solution. Once the hot water is enforced upon, make use of a hose or a brush in order to remove all the accumulated dirt and stains. When all the stains are cleaned, use a machine to soak away the water. Almost everyone of us might have heard about the technique of shampoo cleaning, which is used in cleaning your home carpets. 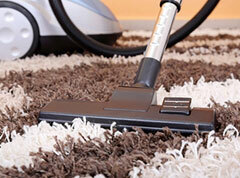 This is one of the simplest and easiest ways used in carpet cleaning of your home. In this method, a solution of shampoo is to be applied on your carpet with stains and left aside to dry. This method doesn’t require any type of sweeping or vacuuming.